Hafthor Julius Bjornsson is strong. In fact, Bjornsson is the defending World’s Strongest Man so his strength is as advertised. That strength also landed him a role on Game of Thrones as Ser Gregor “The Mountain” Clegane. Now, in an interview with ESPN’s E:60, Bjornsson admitted to using steroids at some point during his strongman career. 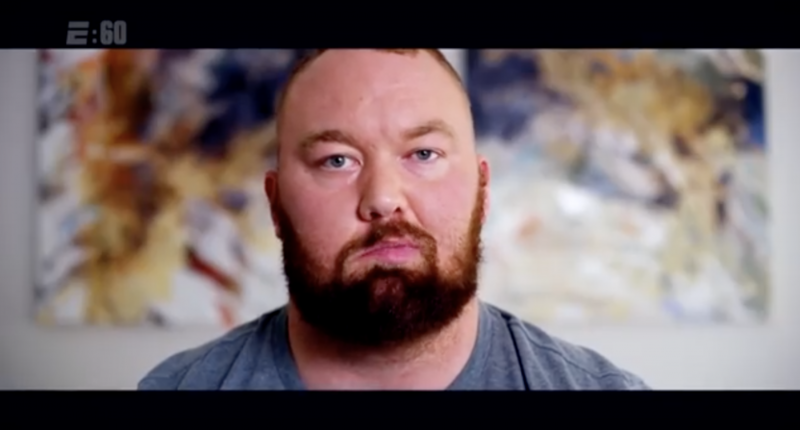 Bjornsson’s interview took place in 2017 so even with his admission, it doesn’t prove that he was on PED’s when he won his first ever World’s Strongest Man competition in 2018. Despite drug testing, strongman competitions can be rife with performance enhancing drugs and World’s Strongest Man organizers don’t really have a clear method to catch users. Despite admitting he took performance enhancing drugs, Bjornsson claimed that he has “never failed a drug test during competition” which doesn’t really mean much when so many people in a variety of sports, like Lance Armstrong, had admittedly beaten the system. The 30-year-old Bjornsson has had his share of setbacks. Originally wanting to be a pro basketball player, Bjornsson was forced to retire at 19 due to breaking the same ankle two different times. I’m not quite sure how deadlifting half a ton is better for your ankles than playing basketball but Bjornsson went to weightlifting and eventually began to compete in strongman competitions. All this while suffering from occasional bouts of bells palsy, which paralyzed half of Bjornsson’s face. With other strongmen prematurely dying after taking steroids, the prospect of a premature death has been on Bjornsson’s mind. But given this is something he wants to do, he wants to keep doing strongman competitions. The final season of Game of Thrones starts tonight and while we don’t know what The Mountain will be doing, he’s likely to play some part in the end. Outside of Westeros, Bjornsson plans to defend his World’s Strongest Man title this June in Florida, hopefully with his PED usage days behind him.